New players wanting to dip their toes in the penny auction waters have added incentive to visit Bidibot.com after the site revealed some new additions that make it that bit easier for new bidders to succeed. There are plenty of bargains to be had at Bidibot.com but, rather like trying out a new poker room, finding your feet in a new environment can sometimes be a bit tricky. The site has recognised that and made some changes for new bidders. Auctions designated “Max Bids” and “Unlucky Bidders” and “No Bot” help level the playing field. Limits on number of auctions won now make it possible for even more poker and casino game players to buy credits for a fraction of their value. Maxbid auctions restrict the number of bids placed by each user and reduce the competition. 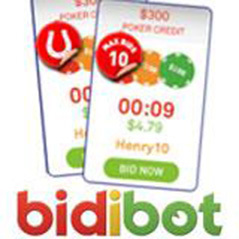 Only bidders who have never won at Bidibot can take part in Unlucky Bidder auctions. Bidibot is also getting into the Valentine's Day spirit by hosting a series of spa break and Top Shop voucher auctions in addition to the usual array of electrical goodies and poker and casino packages. Credits for the likes of Poker Stars, UltimateBet, 888Poker, Absolute Poker, Titan Poker, Victory Poker can all be picked up for a fraction of their true value at Bidibot.com.